January 11, 2019 /0 Comments/in Piano /by Nadia B. 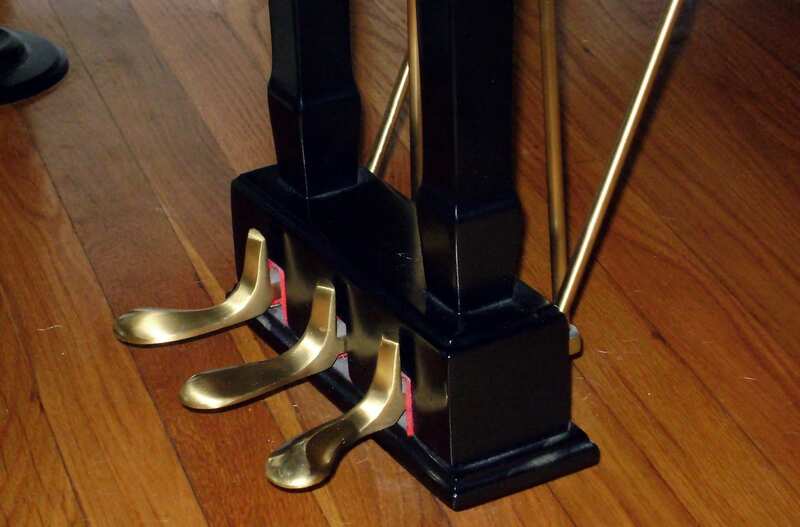 Piano pedals are levers which alter the sound of the piano in a variety of different ways. The three types of pedals most pianos have are, from right to left: a sustain pedal, a sostenuto pedal, and a soft pedal. Note: Some digital keyboards may only have one – the sustain pedal – which you can plug into the keyboard. As you get more comfortable at the piano, you may start to wonder about these three pedals at the bottom. 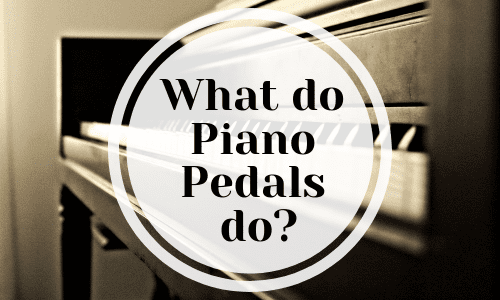 What do the pedals on a piano do? You’ll find the answers in this complete guide. We’ll go over each pedal’s effects, how to use them correctly, and how to recognize them in your sheet music. The most commonly used out of all the piano pedals is the sustain (or damper) pedal. This pedal is the farthest right, and the right foot depresses it. The sustain pedals allows pianists to extend the sound of a note far longer than they could by simply pressing the key. This allows pianists to hold notes for as long as indicated in the music, or as long as they feel appropriate. Some notes will have a fermata marking, which means to hold the note past the amount of time its value indicates. One common usage for the sustain pedal is to hold long chords that are serving as an accompaniment to the melody. The other use of this pedal is to play with a “legato articulation.” This means connecting smoothly one note to the next, without any break in between the sounds. One of its names is the “damper” pedal because it works by lifting the dampers off the strings so that the strings keep vibrating. What typically happens when a key is released from being pushed down is that the felt of the dampers stop the movement of the string. For this reason, the sustain pedal provides an added richness to the sound through sympathetic vibration. In other words, the other strings (not in use) also vibrate along with the ones that are in use. 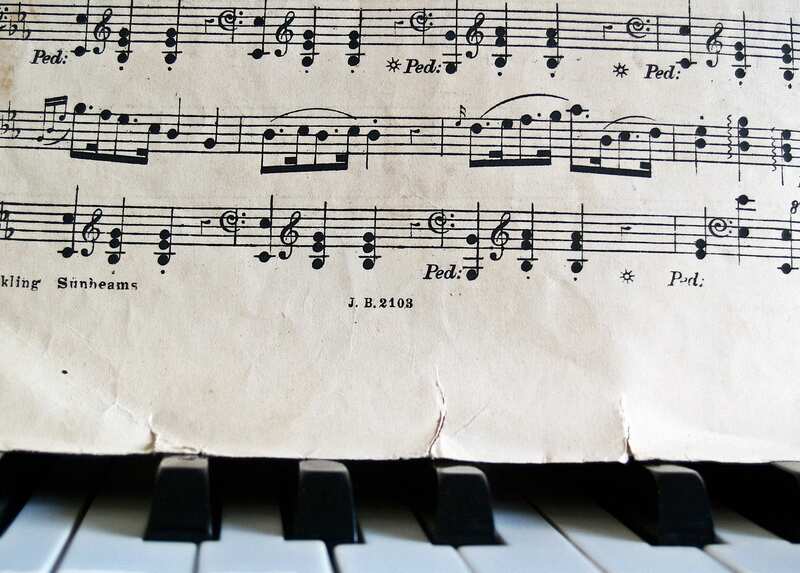 Some music notates the exact places where you should depress and release the sustain pedal. It can also be up to you to decide when and how to use it, so its use won’t always be notated in your music. The most common notation you’ll see is a symbol underneath the grand staff of the music. The symbol shows when to depress it (whether multiple times, or a single time), and when to release it. Below is an example of what a pedaling symbol could look like. In this example, the initial line indicates the start of the pedaling. The carrot in the middle indicates a quick release and re-depression of the pedal, and the final line indicates a complete release of the pedal. Another way of notating the pedal in sheet music is by use of the word “Ped.” This indicates the beginning of a pedaling. A following asterisk (*) indicates the release of the pedal. When pedaling, it’s important to remember that the foot operates like a lever. Your heel is on the ground and the ball of your foot is depressing the pedal. Another thing to keep in mind is that you should always leave your foot resting in contact with the pedal. This way, you can easily depress the sustain pedal when needed. When you’re resting on the pedal, you can even keep it slightly depressed already to make your pedaling more efficient. You’ll notice that doing this doesn’t cause the pedal to engage yet. When using the pedal, you’ll want to depress it slightly before you play a note, or right as you play a note. You’ll also usually want to change the pedal right after playing a note. This level of coordination can be complex and it requires practice. Don’t be discouraged if you find it challenging to incorporate pedaling into your playing at first! The middle pedal is usually a sostenuto pedal. Out of the three piano pedals, pianists use this one the least often. The sostenuto pedal offers an exciting variation on the sustain pedal. Instead of holding down every note struck, the sostenuto pedal allows you to hold down some but not others. This is often used to sustain long bass notes while allowing for melodic and harmonic lines to continue moving. In your sheet music, you’ll see sostenuto pedaling indicated just like normal pedaling, except with the addition of the abbreviation “Sost.” To use this pedal, first strike and hold down the notes you wish to sustain while depressing the sostenuto pedal. Once you’ve done so, you can release the keys you depressed, but they will still be sustained. You can play any additional notes you wish, but they won’t be sustained since they were depressed after you engaged the sostenuto pedal. It’s also possible to use the sustain pedal as you would normally while using the sostenuto pedal simultaneously. The short video below shows the difference inside the piano between the sustain pedal and the sostenuto pedal. Today, most grand pianos are equipped with the sostenuto pedal, while upright pianos have a practice mute pedal instead of the sostenuto pedal in the middle. The practice mute pedal is quite straightforward: it quiets the sound of the whole piano by inserting a layer of felt between the hammers and the strings, so the sound is still created but not as loudly. This pedal is depressed with the left foot. On a practical note, this is useful if you want to practice but need to reduce the volume level for others around. Another useful feature of this pedal is that you can usually lock it to the left so you don’t have to hold it down during your entire practice session. You’ll likely never see a notation for the practice mute pedal in your sheet music since it’s only used for practice. The middle pedal isn’t used frequently and it has different possibilities depending on the type of piano. Because of this, the pedal’s usage and purpose is often misunderstood. Additionally, it could be a “silent pedal.” A silent pedal blocks the hammers from striking the strings, allowing you to hear the sound in your connected headphones only. Or, it could be a pedal with no purpose other than visual show. Another name for the soft pedal is the “una corda” pedal. This far-left pedal appears to simply offer a reduction in the volume of sound. However, the true intention of the pedal is to also offer a change in the color and timbre of the sound. Due to the change in color and volume, this pedal creates a sense of mystery, introspection, or awe. When the una corda pedal was created, it meant that the whole keyboard and its hammers shifted slightly to the right. All the hammers hit only one string rather than the two they typically hit. With modern pianos, using the una corda pedal now means that the keyboard shifts slightly to the right. So, the hammers hit two strings instead of the typical three that are now associated with each note. This means it’s a bit of a misnomer today since “una corda” translates to “one string.” In addition, today’s upright pianos execute una corda a little differently than grand pianos. For this reason, the correct name for the upright piano’s pedal is a “half-blow” pedal. Due to the angle of the strings in upright pianos, the keyboard doesn’t shift when una corda is depressed. Instead, the hammers approach the strings more closely, which leads to a similar effect of lowered volume. Like the sostenuto pedal, your left foot depresses this pedal as well. In your sheet music, you’ll see una corda pedaling indicated with the phrases “con sordino” and “una corda.” The following symbol also indicates una corda pedaling. The phrases “senza sordino” and “tre corde” tell you to release the soft pedal. You may also see the following symbol. This video nicely shows how each of the three piano pedals sound. It also demonstrates good usage of all three pedals at the end of his improvisation. Knowing how to use the piano pedals allows you to add finesse, accuracy, and color to your playing. While it may seem straightforward, pedaling at the piano is an art. There are many techniques you can use to make pedaling flawless within the music. As a piano student, it’s always a good idea to get feedback and advice on how to master pedaling. TakeLessons is an excellent place to find a piano instructor for private lessons, or learn piano in online classes. Have any more questions about what the pedals on a piano do? Leave a comment and let us know! Nadia B. teaches local and online piano lessons in New York, NY. She has been teaching since 2003, and has a degree in Music Performance from New York University. Learn more about Nadia here!